“Rivalry” is probably one of the handful of most overused words in sports, but when a real one exists, it is fairly obvious. The one between Portland Thorns FC and Seattle Reign FC has been obvious from the start. Factors such as the long-standing blood feud between the cities’ respective Major League Soccer sides, plus some general clashes of culture between the Pacific Northwest cities, gave Thorns-Reign some early juice. Five years later, the Pacific Northwest foes have squared off 19 times and have shared the spoils with eight wins apiece and a trio of draws. The 20th match-up, on Saturday afternoon at Providence Park, will take the rivalry to a new level. The Thorns and Reign have combined to win five trophies over the first five NWSL seasons — one every season — but never before have they faced off in the playoffs. That will change Saturday at 3 p.m. EDT when they meet in the semifinal at Providence Park. 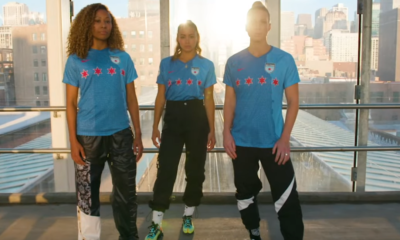 Ahead of what is likely the single most anticipated match in the six-year history of NWSL, let’s take a look back at the history of the one and only tried and true rivalry the league has. The Thorns welcomed the Reign for their first-ever home match and picked up their first win in franchise history in front of a strong crowd. Marian Dougherty scored the first goal in the rivalry for the Thorns, with Alex Morgan adding the second. Jess Fishlock scored for the Reign. Fishlock is one of four who played in the match who remain with their original clubs — Lauren Barnes and Kiersten Dallstream from the Reign, and Christine Sinclair for the Thorns. Michelle Betos is back with the Reign after leaving to play elsewhere including Portland, and Allie Long is now with the Reign after starting this match for the Thorns. Tobin Heath was a Thorn but had not yet arrived from Paris Saint-Germain. Hope Solo returned from injury to make her NWSL debut and the Reign out-shot the Thorns, 19-13 but the Thorns prevailed in their first trip to Seattle on Sinclair’s 84th-minute penalty. The win moved the Thorns to 6-1-1, while the Reign losing streak that began a month earlier in Portland reached seven games. The Reign losing streak reached nine — where it would end — in a 2-0 loss in Portland. Danielle Foxhoven scored just after halftime and Mana Shim tacked one on. Christine Nairn had a chance to make it a frantic final six minutes but her 84th-minute penalty was saved by Karina LeBlanc. The Reign held the lead for the first time in the series when Megan Rapinoe put them ahead just three minutes in. It was short lived, though, as Sinclair tied it five minutes later. It looked as if the Reign would snag at least a point until Sinclair ran onto Tiffany Weimer’s pass and slotted home the game-winner to give the Thorns a 2-1 victory and sweep of the four-game set during that league’s inaugural campaign. A tipping point for the rivalry. Both teams came to the match undefeated. The Thorns had won two and drawn two, and a revamped Reign side had won its first five. The action was tense and the clock crept toward full time with no goals for either team. Just as it seemed like both of them would remain unbeaten, Rebecca Moros have the ball away to Beverly Goebel (now Yanez) who found Kim Little. The eventual MVP took a calm touch around Nadine Angerer and scored in the 90th minute to give the Reign their sixth straight win and first ever against the Thorns. A few days later, Solo posted a photo on Twitter of being given the finger by a member of the Riveters. The Thorns’ first visit to Memorial Stadium got ugly. Sydney Leroux put the Reign ahead in the 3rd minute, but unlike when that happened a year earlier, when the Thorns rallied, this time the hosts kept the pedal to the metal. 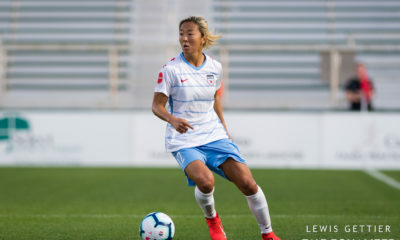 Nahomi Kawasumi scored within five minutes on both sides of halftime, on assists from Little, and then Kawasumi fed Rapinoe for the fourth goal in the 57th. 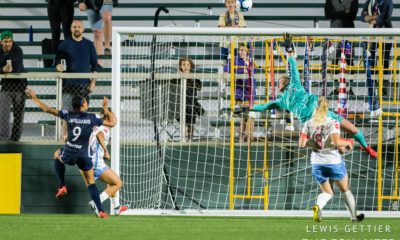 Little added the 12th of what was her league-leading 16 on the season in stoppage time for a 5-0 final that has been equaled but never surpassed as the most lopsided NWSL shutout. For the second year in a row, the Cascadia rivals met on the final weekend of the regular season. The Reign had long since secured the Shield, but the Thorns needed the game to assure themselves of a playoff berth. Morgan scored the only goal of the day to put the Thorns in the playoffs by a point. The result was overshadowed by a first-half injury to Nikki Marshall. A former WPS first-round pick, Marshall had started every Thorns game to that point, but a torn ACL saw that streak end a week later in a semifinal loss to FC Kansas City. Marshall retired the following February. The first game in Portland after the United States’ World Cup triumph produced the first sellout in team history, but 21,144 went home disappointed when Little’s 57th-minute goal carried the day. 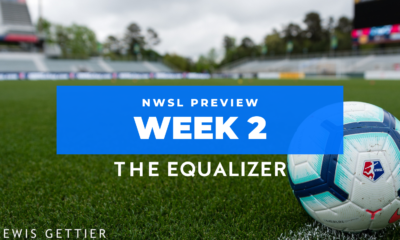 The World Cup stars returned but Morgan’s knee did not allow her to play, and the Thorns’ second straight loss started their season spiraling out of control. It remains the only time they failed to qualify for the playoffs. A scheduling oddity saw the teams play twice, four days apart. The Reign rolled behind a Fishlock goal and a Yanez brace in the first five minutes of the second half. Foxhoven came off the bench for the Reign to become the first player to suit up for both teams against the other. Jessica McDonald suited up for both, but never for the Reign against the Thorns. The crowd of 6,303 remains the largest in Reign history. For the first time, the teams shared the spoils. Nadia Nadim came out of halftime with an immediate goal, the Thorns first against the Reign in two years. Three minutes later, Yanez tied it. It was the first goal of the season for both and those were the only two goals on the day. The Reign lost Manon Melis to injury in the opening five minutes. She did not play again until June 25. The second straight draw was the first Cascadia Derby without a goal. Haley Kopmeyer and Michelle Betos collected the clean sheets. Betos joined the list of players to play on both sides of the NWSL’s best rivalry. In one of the great grind-em-out wins, a woefully depleted Thorns team defended for nearly all of the 90 minutes and prevailed when Nadim got in behind in the 74th minute to stick home the only goal of the night. 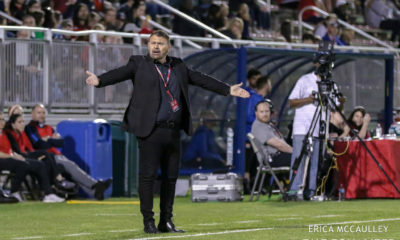 Thorns coach Mark Parsons said he apologized to Nadim before the game for his plan of leaving her so isolated up top, and that she had responded by saying she would score a goal. Twenty-eight days later, they completed a home-and-home, this one on the other side of the Olympics. Melis, injured in the first meeting of the season, scored the first two goals and the Reign carried the 2-0 lead into stoppage time. Things got a bit hectic there when Long scored in the 92nd minute but the Reign not only hung on, but regained the two-goal lead through Rapinoe in the 94th. It was Rapinoe’s first NWSL match of the season after spending the first half rehabbing a torn ACL and then making her return for the United States in the Olympics. Fishlock scored the quickest goal in the series when she put the Reign ahead in the 1st minute, and then scored the first own goal when she made what was a perfect finish into the wrong goal to bring it level. Merritt Mathias put the Reign back on top two minutes later and it stayed that way for 44 minutes until Long equalized in the 82nd. Rapinoe scored both goals, the opener in first-half stoppage time when Emily Sonnett got lazy on a back-pass andRapinoe swooped in to steal it and finish. The match also saw Fishlock come off injured in the first half when she landed awkwardly on a challenge by Lindsey Horan. Fishlock would miss the next three games. After this one, the Reign were running two points ahead of the Thorns, but wound up missing the playoffs while the Thorns went all the way to win the title. In the “first to 50” match, both teams arrived with 49 all-time regular season wins and a chance to become the first team to crack the half-century mark. Hayley Raso scored two goals to make sure that team was the Thorns. Fishlock added a late goal from the spot, which prompted Reign coach Laura Harvey to say she had “no idea” what her team was awarded a penalty for. Harvey was denied her 50th win in this one, though a week later she became the first coach to reach the milestone. Long became the highest profile player to jump to the other side of the rivalry, and played a fine game in her return to Providence Park. And in what was one of the games of the year, Rumi Utsugi sent the visitors home happy by breaking a 2-2 tie with a wicked shot in the 75th minute. The match got wild on the hour, when three goals happened in nine minutes. Sonnett and Horan hit equalizers sandwiching a Jodie Taylor penalty that put the Reign back on top. Taylor hit the second-latest winner in rivalry history when her 89th-minute tap-in of a wonderful cross by Rapinoe carried the Reign to a 1-0 win. It marked the first time the Reign went ahead of the all-time series. The sellout crowd went home happy this time after the Thorns scored three unanswered to complete a late-season rally to finish second and earn the right to host Saturday’s semifinal. 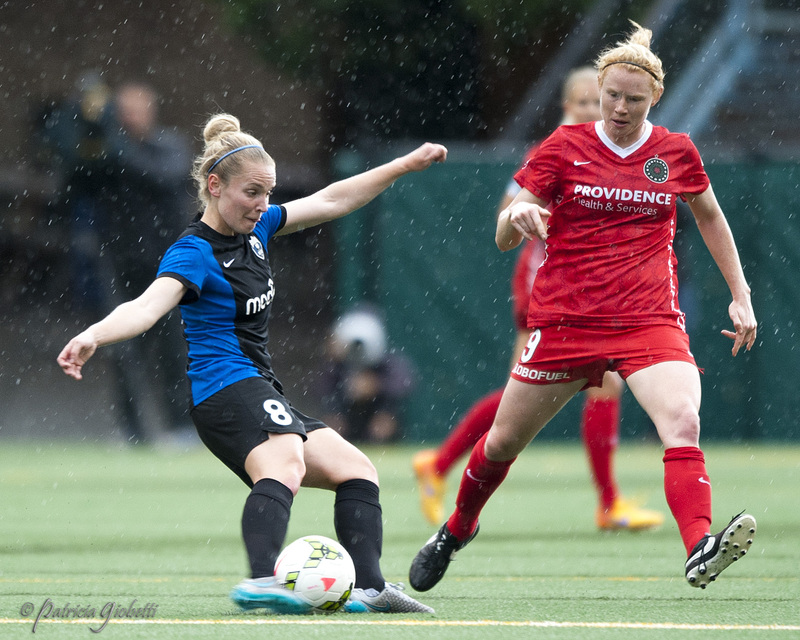 Fishlock opened for the Reign, but it was all Thorns after that. Horan leveled it on 30 minutes and Tobin Heath scored her first goal against the Reign to send the Thorns on their way in the 49th minute. Horan scored her second in the 80th to put it out of reach.